Three years have passed since the war between the Six Orders, the ancient societies governing magic, and 19-year-old Terry Howard, Acolyte of the Midnight Order, is just trying to live a life as close to normal as possible. With the support of the few people in the world he hasn't alienated, that almost seems possible. But when his ex, Carrie, asks him to look into a magic-related suicide and his mentor, Stanley, announces his retirement, Terry is forced deal with his emotional baggage before everything he's managed to build gets torn away. There's a good story starting in this book. Thought there were some strange choices (pun intended) as to how the characters interacted, almost as if they didn't like each other at times. The narration is good. I think this could be a good series if the story was just a little more polished and character interaction had better depth, all the other elements are there. I have to be honest, this was not a big winner for me. Mostly because I so often didn't know what was going on. There was a huge cast of characters who were never fully introduced, let alone fleshed out. Terry seemed to develop skills and knowledge as needed in a very hand wavey kind of way. And though there was plenty of action, there was 100% no emotion. This in a character who was supposed to be suffering PTSD and encountering frightening experiences. It all felt very flat. What's more, I couldn't really see Terry as 19 and, while he's supposed to be super trained or something, how his friends had their power/skill or how they all met was not addressed. This is marked book one, but maybe there is a prequel out there or something? For sure, something is missing in this book, something important. Lastly, I was not impressed with Loving's narration. It was too fast. This didn't bother me at first or when I listened to the sample, but it sure did as the book went on (and it sounded funny if I listened at .75x) and I just don't think he did a very good job at sounding natural. I did very much appreciate the diverse cast and mechanically the writing was pretty good. Others may very well love this. I didn't. I saw how it could have been pretty good, but don't think it quite managed it. Note: I received an audible code for the purchase of this book. I chose to listen to it and review it. This is obviously the first book of a series. The story seemed to have a bit of a pacing issue at first, but after a little bit, seemed to find it's way. I thought, over all, the story was pretty well written and I found myself engrossed in the story. The narrator did a good job on the voices, making the characters interesting and the experience entertaining. I would be open to more books in the series. The core story was a decent one but its execution fell a little flat for me. There was an abundance of unnecessary swear words and the pacing was very inconsistent. The characters were underdeveloped as well. The second half of the book did pick up in pace and I do see promise in this Author. Since this is the 1st in series and there are 5 total now I am sure that the Author grew and learned with each new release. I would be willing to give book 2 a read (or listen). 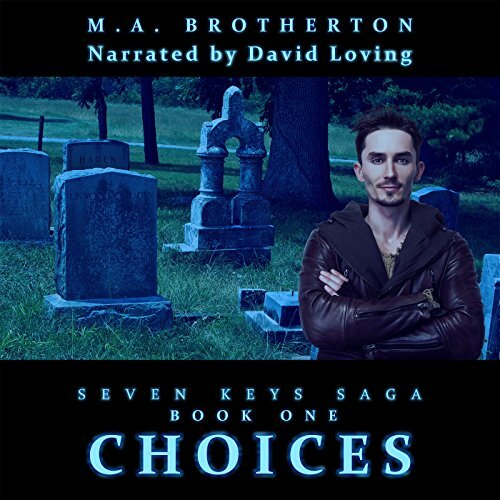 David Loving's narration was easy to understand and proper inflection was expressed. I would purchase other Audiobooks narrated by him. I was given this free review copy audiobook at my request and have voluntarily left this review. I received this audiobook through Audiobook Boom and I'm required to leave a review within one month. I got 6% through and realised that I had no idea what was going on, who the characters were and where The Old Hag had come from. I do intend to give it another try, but it's hard to make myself pick it up again when I have other, wonderful books to listen to. I am so so glad I took a chance and read this book because it was absolutely out of this world.Phenomenal.some books ,as rare as this is,you want to give more than a five star rating.If I could I would !By far, the most compelling aspects of this first instalment is the complexity of the society created. The Midnight Order ,the pose war, the magic and then there's Terry who had to man up in a big way and dang he makes us proud.If you are Ilona Andrews fan I very much recommend this book. David Loving did an amazing job taking us through the story of the Magic,Mayhem and a Mystical mishaps and a labyrinth Tale and who and breathed life in to a seriously kick a** tale. A true shinning diamond in its genre.Brotherton created something I wasn't expecting but am overjoyed that this series is out there and will be continuing.